Microsoft's started work on it, it seems. Sounds like a 2014 launch, IMO. Why 720 though? Why not go all out and make it a 1080? Just a placeholder name. I have no idea what the next Xbox would be called. HexBawx Triple WITH MORE Kinect KENNICKTEKTIN!!!!!!! ? Why is it blue? That's Sony's thing. 2014... This gaming generation lasted quite a while. Can video games honestly get ANY better graphicswise? Not that much, but still noticeably. In any case, the hardware can make it easier for developers to make games with higher-quality graphics. Or maybe graphics might not improve much but we get much less loading times and larger, more sprawling worlds? So Microsoft wants more hapless peons, that doesn't mean that they're starting work on a new console. It isn't better graphics, really. It's the ability to have more going on on the screen than before. ^^ I agree. This proves nothing. All they would really be doing is exploring the theoretical ideal of one day possibly making a new console. Watch as Nintendo's "underpowered" 360-level console sweeps the next hardware cycle with a sub-$250 price tag and control gimmick again. That said, I wonder if the Wii will even hold out till 2014, or if Nintendo will put it to rest before the PS4 and XBox Whatever come out? Well, I do know it's not necessarily the graphics. But perhaps are there going be new gimmicks that the newer generations of consoles would tap? Nintendo and Sony have both been focusing on the handheld space. I think they see that's where the money is right now - provided they can replicate the App Store's success. The victor in the next home console product cycle will be the one that makes the home console and all of its trappings portable a la the PS 1 or the Treamcast. As in easy to take to a friend's house? 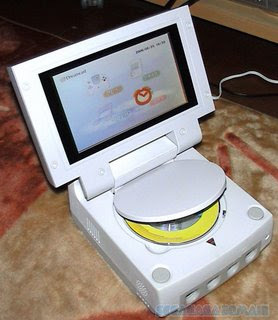 How was the Dreamcast easy to move around? Moreover, who cares about that feature? My money is on digital distribution and some freaky cloud server magic. Hopefully it won't be a graphics race this time. I think it means in the day of the PS 1 and DC all you had to do was bring your memory card and the disc to your friend's house if you wanted to show off a cool game or your awesome play-through or multi-player with all the unlocks, now though you have to bring your whole console if you want to show your friend something, while the DC was big it's still not as big as a Slim PS 3 or Xbox. Treamcast ◊, there is a difference. And the idea would be that you could take your home console with you just about anywhere. Wanna play some (insert game here) with your friends in a bar? No problem. Don't have a monitor? No problem. Just bring your console, your game, and a few controllers. So it's two Xbox 360s duck taped together?